You have grown into a very handsome rooster. Hi Big Red! Happy Pet of the Day! 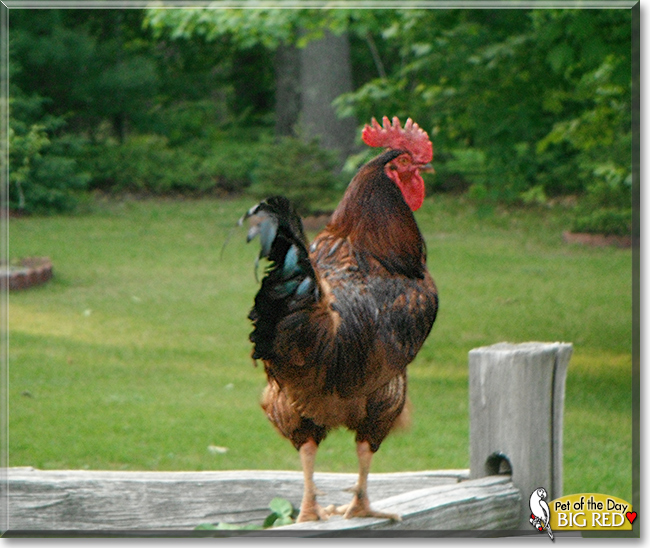 What a stunning, oh so handsome Rhode Island Red Rooster you are, Big Red, a boy who sure knows how to strike a pose! As the saying goes, if you've got it, flaunt it! I just LOVE hens and roosters, Big Red! All of you so uniquely beautiful in your coloring, and contrary to what some might believe, packed with personality, sweet and loving...just like you! How lucky your family is, having a REAL feathered family member as beautiful, as sweet, as special as you Big Red! You're a gem! Thanks for the BIG smiles, sweetheart! Meeting you today has been a real treat! I hope you're enjoying a very special day of celebration...looking after the ladies and strutting your stuff, hehe, spending special time with your humans, receiving tons of pets and cuddles, being loved and pampered to pieces! Lots of love, snuggles and wee kisses to you, beautiful Big Red, our very special and most deserving Pet of the Day, EVERY day! Love to all of the ladies, too!